எழுகரை நாட்டவர் தம்பிரானே. 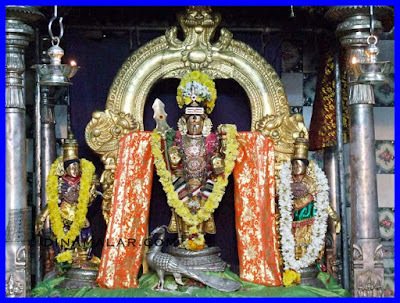 Above song by Saint Arunagiri Nadhar is a beautiful one, shows us how to worship God.How devotion towards God,transform both our mind & body.It is learnt that "Pongi" a friend of Goddess Valli sang into the ears of " Vallimalai Swamigal'(lived in the period of saints Sheshadri & Ramanar of Thiruvannamalai)this song for him to learn. God Muruga ,I should melt in devotion towards you,tears filling my eyes,love to reach you should grow more & more & with fumbling voice.I should worship in this state of mind repeatedly. Saravana,Shatachara( சரவணபவ) grown & fed by six angels( கார்த்திகைப் பெண்கள் ).You have shown me the path of liberation (பரகதி ) , grant me that.You are a great warrior.You are the son of God Shiva who burnt "Manmadha",the God of desires & love with a just a glance towards him & son of Goddess Bhagavathi(Parvathi).You destroyed the demon in the form of Krouncha mountain in the sea.you rescued the Devas their kingdom & made them live their normal life. Many persons escape from the the cycle of birth & death .How they achieve it . Krouncha mountain is compared to our Karma containing both good & bad deeds from our many births.This is classified in to 3 form. 1 - Sanchitham 2 - Praraptam. 3 -Aakamiyam.Sanchitha karma is the bag that we bring in to this earth when we are born. Praraptam is that we experience in our life like comforts & sufferings in our life.Aakamiyam is that we acquire in our present life which reaches the bag Sanchitham.Chitra Gupta records all our activities in a hard disc in his Master computer& shows to Yama Dharma.He awards heaven or hell according to our karma deeds.Balance karma informations (pending- we can not undergo all the karmas in one stroke because it is like ocean) are passed on to God of Creation Brahma who in turn writes in our head in the form of of genes.No one can escape from this.This is clearly told in Baghavat Geeta by God Krishna to Arjuna.In Karma Yoga chapter,"Karmani yeva Adhikarasthey ,Ma phaleshu kadhachana". You are entitled to perform your duty only & not its fruits .கருமத்தை செய்ய மட்டும் உனக்கு தகுதி உண்டு வினைப் பயனில் அல்ல,வினைப் பயன் விளைவிப்பவன் ஆகி விடாதே.Those who want more details has to look in to "Karma & Akarma in Geeta.These are clearly told in Vedham & Upanishads & Sastras.Guide lines are issued.God regularly sends saints periodically.Some listen to them.He himself comes to this world in the form of Avadharam. (like Rama, Krishna).Avadharam means coming down.He took too much pity on us & hence Avadharam.திருக்குறளில் சொல்கிறாரே அழகாக ,இருள் சேர் இருவினையும் சேரா இறைவன் என்று கடவுள் வாழ்த்து பகுதியில். Some may have already known these things.I just pass on to you.This is photo of Sikkal Singaravelavar.Photo courtesy Dinamalar magazine. Labels: Divine hymns - Thiruppugazh.